instead turned into an epic DIY adventure of crazy proportions! Walls: Numerous holes filled and painted white and pipes re-routed. Floor: Lino scraped off around the sides of the room and painted with grey concrete floor paint. Rubber gym flooring and mats assembled in the new room configuration. Equipment: Chris' turbo trainer with Matt Smith's bike on (he trains with Chris in the week), Caroline's C2 rowing machine, Chris' SRM indoor bike trainer, (out of shot there are also; kettlebells, Olympic bars, mad variety of foam rollers, yoga mats for stretching, wobble board, body bars, reebok step block and therabands). 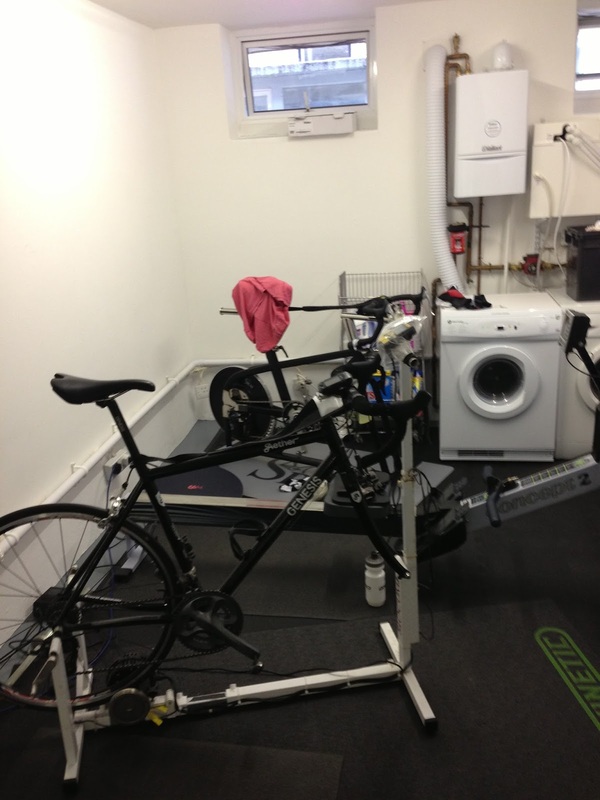 Do you have a home gym (shed / garage) or do your exercise at your work gym / local fitness centre? DIY tasks are rarely as straight forward or as simple as they may seem lol:). But the end result looks really good, you have really maximised the use of the limited amount of space you have so congratulations on your new gym ..... great job! I have my 15yo model C rower in the spare room which doubles as a storage room and is haphazardly cluttered with miscellaneous items and other junk .... much to my wife's disgust! I'm having a large shed built over the next couple of months which i'll set up as a gym, workshop and storage area. Then we can reorganise that spare room. Sounds like a great plan Dave - you will have to send me some photos when you have built your Man-Shed so I can share it with the rest of the team.... I'm sure other wives / girlfriends will be getting ideas too!! I'm really pleased with the new gym. The only slightly annoying aspect is that I have to dodge / jump over my C2 to get to the washing machine, but its such a minor issue I'm not really fussed. 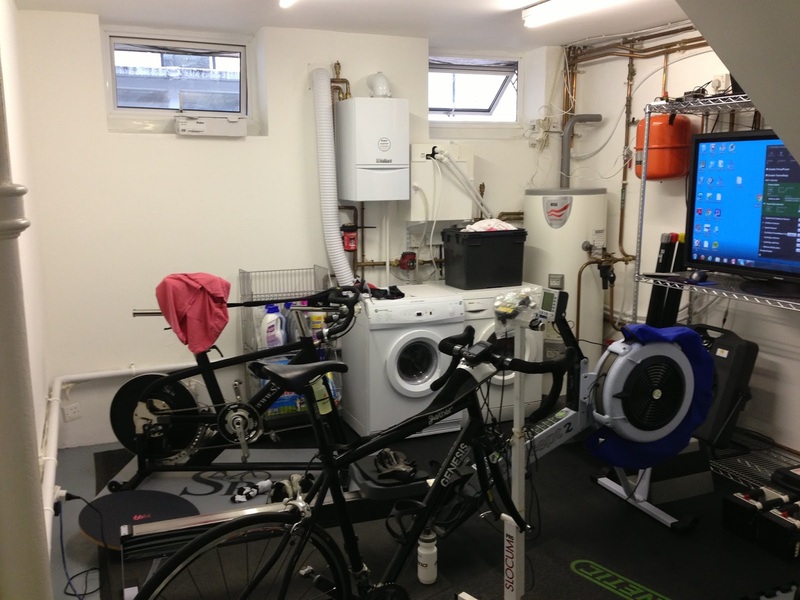 I would rather have a great place for working out than a whole room dedicated to washing and drying!! This looks impressive. Well done for DIYing it too. My model C is out in my shed. Got electirc hooked up out there but no TV/entertainment beyond the ipod unfortunately. I've probably mentioned (moaned) before about how ridiculously hot it's been in there recently, but it was equally cold in the winter! Hoping the extreme temperatures help with overall fitness in some sense or another?!? It sounds like you are in training for some kind of Die Hard / Iron-man style event (sweat-box in summer / ice-box in winter). Let's hope this extreme temperature training helps you become a honed erg athlete by the end of the season! On the plus side you will become totally nails and impervious to temperature changes.... Lucas "What do you mean It's Cold / Hot? I hadn't noticed....."
As I already share the utility room with the washing machine/tumble dryer and boiler and call it my office, there is not really room for the C2 as well, although in the past (and in desperation) I can fit it part in and part out and row through the door as long as I have a piece of wood between the foot and the wall to stop me rowing into a wall! Normally I row in the space between the sitting room and dining room which are open plan. I'm just about out of the way and can still see the TV, but when I was doing 70-100k a week, it did in the end get on my wife's nerves....unsurprisingly! If the weather good enough, and I remember, I do occasionally row out on the decking...then the Guinea Pigs have to put up with the noise instead! I bet the Guinea Pigs love it when you are whizzing up and down on your C2. I can imagine how popular you were when you were rowing 100k in a week in the living room - not the best way to get into your other half's / halves?! good books. Thanks for your positive comments - "stop whinging and get on with it" was more the sort of reply I expected to be honest! Can always try to get Mrs N to agree to the sitting room if the temp really drops in winter... won't hold my breath though.